-The Giardia is diarrhea causative protozoa being parasite in small intestine of dog and cat. -This pathogen lives attached in epithelial microvilli of small intestine and reproduced by binary fission, and being distributed in world wide at least 5%. - In young puppies tend to be highly infected especially in group breeding. No specific signs in adult dogs and cats but puppies and kittens could be shown watery or foamy diarrhea with bad smell due to malabsorption of intestine. - High mortality due to severe weight loss of acute or chronic and intermittent or continuous diarrhea. - In addition to young animals, those that are stressed, immunosuppressed, or housed in groups have the greatest prevalence of clinical disease. 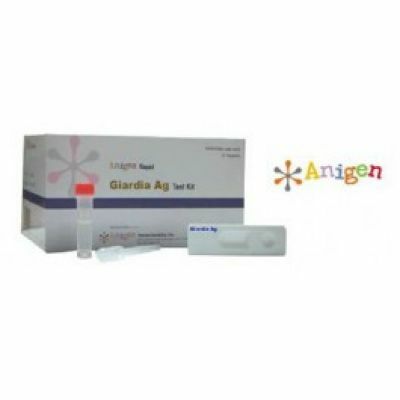 - Principle - The Anigen Rapid Giardia Ag Test Kit is a chromatographic immunoassay for the qualitative detection of Giardia antigen in canine or feline feces. - Reading time: 5 ~ 10 mins.